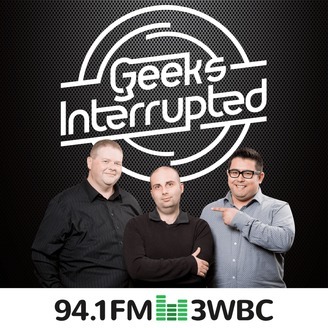 Geeks Interrupted is a weekly 2-hour tech show broadcasting live from the studios of 94.1FM 3WBC in Box Hill near Melbourne, Australia. Phil Edwards, Andy Blume and Daniel Olivares discuss the latest news on geek topics, tech, gadgets, pop culture, TV, film and other random stuff. Listen live on Mondays from 8pm-10pm AEST. Contact us or send us feedback via our website (http://geeksinterrupted.fm), follow us on Twitter (@GeeksOnAir) or like us on Facebook (http://facebook.com/GeeksInterrupted).